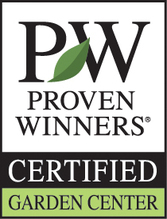 Why is English Country Gardens proud to be a PROVEN WINNER CERTIFIED GARDEN CENTER? Just as we are proud to announce our MOTTO of "GROWN IN THE MOUNTAINS TO THRIVE IN THE MOUNTAINS! Proven Winner plants have a MOTTO of: Start Health, Stay Healthy!! Proven Winners plants are strenuously tested for performance. They go that extra step to ensure that every plant is screened of all plant diseases and viral organisms. This process is neither inexpensive nor fast. English Country Gardens and Proven Winners work hand in hand to ensure you have a successful gardening experience. It's a simple concept but we at English Country Gardens want you to remember English Country Gardens as providing you with the best plants you've ever grown. Then you, like Proven Winners, will proudly say: A Better Garden Begins with a Better Plant.